Visit Uganda and completely immerse yourself in the fascinating world of the rare and elusive mountain gorillas and chimpanzees on this special great ape expedition. See through the eyes of Jane Goodall and Dian Fossey as you get up-close and personal with these incredibly complex and social animals, all within the boundaries of Uganda’s forest habitats. Special access permits in Kibale National Park grant you full days with the Chimpanzees (most visitors have only two hours), giving ample photographic opportunities. For two-and-a-half days, immerse yourself among chimpanzee families, many times within just a few feet of them, witnessing and photographing intimate moments while chimps wake up, groom, forage, interact, and play together. Spend two days game driving in search of the tree-climbing lions of Queen Elizabeth National Park and a host of other African species. Delve into Bwindi Impenetrable Forest, a UNESCO World Heritage Site; for three days, you will hike into the mountainous jungle habitat to locate and observe the rare and special mountain gorillas. Your time will be spent observing the daily routines of these gentle giants while they feed, socialize, parent, and trudge through the forest. You will leave with amazing images of Uganda and beautiful portraits of these remarkable creatures, but above all, you’ll leave with a sense of awe and wonder from the close encounters with our nearest ancestors. • Up-close encounters with the mountain gorillas in Bwindi Impenetrable Forest. • Two-and-a-half days with chimpanzees in Kibale National Park to observe and photograph behaviors. • Enjoy a specially planned opportunity to join researchers as they track African Lions in Queen Elizabeth National Park. • Our exclusive small group keeps encounters private and without interference by other visitors. Oct 25 Travel day to Entebbe, Uganda. If you are traveling from the US or similar distance, you will likely have to depart home today. Arrive in Entebbe by this evening. Upon arrival at the airport, you will be transferred to the hotel to recuperate from your flights and prepare for your upcoming adventure. Drive from Entebbe to Ndali Lodge in the popular Kibale National Park. Kibale National Park is known for its variety and concentration of primates, such as vervets, l’Hoest’s, red colobus, black-and-white colobus, chimpanzees, and olive baboons. You may also encounter forest elephants, which are smaller and hairier than the savannah elephants. Kibale National Park is home to roughly 1,500 chimpanzees, all separated into various troops and some lone individuals. Several of the troops are habituated to humans, so you’ll be able to observe them throughout the day without them getting anxious or upset. We obtain special permits that allow you to spend full days with the chimpanzees. Plan to be up before dawn and hike into the forest, arriving at your focal chimp group just in time to see them wake up and rise from their sleeping nests. You’ll spend the day watching them as they eat, groom, play, take care of their young, and go through their daily routine in their natural habitat. Your expert guide will describe behaviors and point out other species you will see along the way such as other primates, bush pigs, dukiers, many amphibian and reptile species, and over 375 bird species. On the last morning, you will take a tour of the Bigodi Wetland Sanctuary to see other primate species and many bird species. The wetland boasts a rich habitat and great conservation success story. The area, once known for poaching, is now run and managed by the locals who directly benefit from the tourism. After touring Bigodi, you will follow your chimpanzee troop for the remainder of the day. You will bid farewell to Kibale and the chimpanzees and drive to the northern sector of Queen Elizabeth National Park. Located within the famous Albertine Rift Valley, the park is home to over 95 mammal species and over 600 bird species due to the variety of habitats found here, including savannahs, wetlands, and rainforests. You’ll take an afternoon game drive to explore the park and have time to relax by the Kazinga Channel. Depart for an early morning game drive in search of elephants, hippos, buffaloes, and the famous tree climbing lions. Then, head to the mating ground of the Uganda kob, a species of antelope that appears on the Ugandan national flag. Game drives in the Ishasha sector may also bring you many more wildlife in their natural habitat. You will also spend half a day with lion researchers as they track lions – a special opportunity most tourists never experience! Take a scenic drive south to Bwindi Impenetrable Forest, home of the critically endangered mountain gorillas (Gorilla beringei beringei). This forest is part of a national park that lies on the edge of the Albertine Rift Valley, in southwestern Uganda, with a wide altitude range between 1,160m and 2,600m. The forest dates back to the ice ages and is one of Uganda's oldest and most ecologically diverse regions. It is home to almost 400 species of plants, 350 species of birds, including 23 Albertine Rift endemics, plus 120 mammal species including rodents and bats, as well as mountain gorillas, olive baboons, chimpanzees, elephants, and antelopes. Your knowledgeable guide from the lodge will take you out to track mountain gorillas each day. After a briefing by your gorilla guide, who will tell you about your assigned gorilla family and appropriate safety precautions, you will make your way to the trailhead for the start of a thrilling adventure. Expect to hike long distances in steep and sometimes muddy conditions, taking anywhere from two to eight hours to find the gorillas, so be prepared for a long day of hiking. Once you arrive at your family of gorillas, you have one hour with them as they go about their daily life. You will observe feeding, moving, playing, raising their young, and sometimes wrestling by the juveniles. Coming face to face with a giant mountain gorilla is a truly breath-taking wildlife experience! Fly back to Entebbe for connecting flights homeward. Fly back to Entebbe on a private chartered plane. While in Entebbe, you will have a dayroom to refresh before catching your international flights home. Visit Uganda and completely immerse yourself on this special great ape expedition. Costs are per person, double occupancy, not including airfare (except chartered flight from Bwindi to Entebbe), singles extra. See Included and Not Included sections for more details. Payments will be due based on the schedule above. All reservations require a deposit to confirm reservation of your space. For reservations made after a due date, all past payments will be due with registration. By sending your initial deposit, you agree to accept our payment schedule as a contract. If payments are still outstanding two weeks after the due date, your space may be forfeited. All leaders, transport, and park entry fees for all activitiesdescribed in the detailed itinerary. Permits for two full days and one half-day tracking chimpanzees in Kibale National Park and three one-hour visits with gorillas in the Bwindi Impenetrable Forest. Chartered flight from Bwindi to Entebbe on November 6. Lodging for the nights of October 26 through November 5. A day-room is provided on November 6. Meals from dinner on October 26 through lunch on November 6. Bottled water while trekking and in game drive vehicles. Transfers on October 26 and November 6 between the airport and the hotel in Entebbe. English-speaking drivers, park rangers, and trackers. Short Term AMREF Flying Doctor medical emergency evacuation insurance. This does not include hospital or treatment costs. For more information, see www.flydoc.org. All airfare (except flight listed as included), airport and departure taxes, and excess baggage fees. Airfare is approximately $1,000 from the USA to Entebbe, Uganda (estimated April 2018). Gratuities: tipping is, of course, discretionary, however we suggest budgeting about $45 to $50 per participant per day for October 27 to November 5 for our local guides, tracking assistants, and lodge staff (about $450 to $500 total per participant). Hiring of local porters (optional) to carry your gear during hikes to find chimpanzee and gorilla. Uganda generally stays the same temperature year-round. Daytime temperatures range from 65 to 85°F with nighttime temperatures in the mid-50s°F, but with climate change weather is more variable, so prepare for varying climate conditions. October and November are the transitional months between the rainy and dry seasons in Uganda, so expect some rain. The Bwindi Impenetrable Forest is rainy and fairly damp year-round. Hiking in search of gorillas and chimpanzees will total two to six miles per day (over four to eight hours) in steep, uneven, and muddy terrain.You’ll hike regardless of the weather conditions. You can hire a local porter to carry your gear during the hikes; this is highly recommended so that you can focus on photography and the rugged terrain. Please contact us if you have any health concerns that may make this trip challenging. Airfare, except flight listed as included, is not included in trip costs. Detailed logistical information and the contact information for our recommended flight-ticketing agent are included in the Trip Materials we will send you. Please let us know if you are arriving earlier or staying later as we are happy to assist you with any extra overnights that you might want to arrange. Flights you (or a travel agent) book: Plan to arrive in Entebbe, Uganda (EBB) anytime on October 26. Plan to depart Entebbe in the evening on November 6. Flights we book for you: One-way flight from Bwindi to Entebbe on November 6. The cost of this booking is included in the tour cost. Why is this a photography tour? Scott knows Uganda well and is eager to show you photographic techniques for optimal photography with primates. Our days are planned to spend as much time as possible observing and photographing wildlife behavior. Although this trip emphasizes photography, any skill level is welcomed and encouraged. You can forego photography altogether to watch animal behaviors for long periods of time if you choose. Our small group size gives us the flexibility to stay at a perfect photographic moment to capture world-class images. 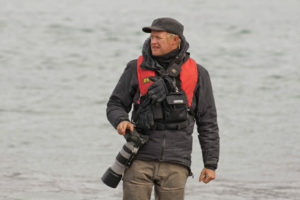 Scott will offer instruction on wildlife photography throughout the trip, as well as offer one-on-one critique time in the evenings. What are the primate encounter rules? • Your guides will review these rules before you visit the chimpanzees and gorillas. • Do not approach closer than the minimum distance of 7 meters (21 feet) from the primates. This is to control disease transmission and to not aggravate the animals. • Total silence, no smoking, no eating or drinking, and no pointing or staring directly at the primates. • Follow the guide’s directions and actions at all times. • Move slowly and be calm at all times. • If you are feeling ill or know that you have a contagious disease, do not attempt to track the primates. Chimps and gorillas are very susceptible to human diseases. You will not be allowed a refund of your permit if you cannot go trekking. Please respect this rule and put the primates’ health first. You will be staying at high-end lodges and tents. All rooms have private baths. Laundry facilities and additional amenities are available at all lodges, though may cost extra. After a long day of hiking to find the apes, you will appreciate the niceties of a warm shower, sunset views at the bar, good food, and a comfortable bed. Maximum time in nature:We try to spend as much time in nature as possible, sometimes resulting in long days, but giving you a more in-depth experience. Itinerary route:The itinerary route, stops and plans are subject to change by unforeseen circumstances beyond our control, such as weather or road conditions. Additional forms:For some of our tours, you may be asked to fill out additional forms (e.g., medical questionnaire). "Scott helped hone my photography skills; his guidance and encouragement were invaluable." "Seeing Chimpanzees interactions and communications including drumming on the trees was special. Being close to a mother Mountain Gorilla while she nursed her one-month-old baby with tenderness is a memory I will have forever."